Housekeeping Camp in Yosemite National Park is located by the Merced River, with a swimming beach, great value in lodging and in close proximity to the best attractions in Yosemite. Book Online. Housekeeping Camp Yosemite allows you all the joys of camping without having to deal with setting up a tent. Staying here gives you incredible views of Yosemite Falls and Half Dome as well as easy access to many more things to do and see. 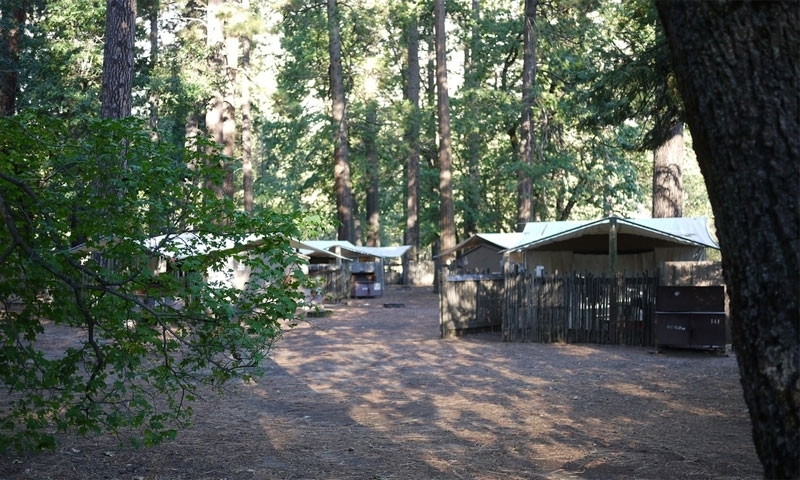 Housekeeping Camp Yosemite National Park is located at 9005 Southside Drive in Yosemite Valley. This is shuttle stop 12. Yosemite Housekeeping Camp has some excellent views of Half Dome and beautiful Yosemite Falls. There is also a beach on the river where you can swim. But there are many famous sights and attractions nearby in the valley. Of course, you must make time to visit Yosemite Village, where you can tour the park’s Visitors Center and browse through the art galleries. Don’t miss the Ansel Adams Gallery! Start out on some exciting hikes right from Yosemite Valley. Many will take you into the backcountry, but there are also shorter hikes on paved loop trails. See how the Ahwahnee Native American lived here in the valley. Find out how they weaved baskets and accomplished beadwork. You can even try your hand at these arts. Stopping at the Tunnel View turnout will provide you some breathtaking views of the whole Yosemite Valley. This is the highest waterfall in North America and worth taking time to visit up close. You can even hike to the top. This granite giant stands 3,600 feet high, one of the most famous sights in the park. Yosemite National Park Housekeeping Camp, open from April to October each year, has 266 units that accommodate up to 6 people. The units have three concrete walls and a concrete floor, with a double canvas roof and another wall that is curtained, separating the sleeping area from a covered patio. At each unit you have a picnic table, a food storage locker (bear-proof) and a privacy fence. In the sleeping area are bunks and a small double bed, a table and chairs. Electrical outlets and electric lights are provided. Central restrooms, shower facilities and a laundry are close by. Guest services include free transportation to locations within the valley, a camp store with basic supplies and free parking. Call 888-413-8869 or Book Online for reservations at Housekeeping Camp.